The main character of the series is Kagurazaka Yuna, a somewhat ditzy 16-year old girl. After winning a "Galactic Bishōjo Contest", she becomes "The Savior of Light", a magical girl charged with defending the universe from evil. After becoming the "The Savior of Light", Yuna gains an impressively powerful armored suit. Her greatest strength, however, lies in her ability to befriend anyone, even her enemies. Her group of comrades (which is extensive) is comprised almost exclusively of former opponents. Yuna is the main character of the series. At first, she was just another normal schoolgirl: a first-year student at Yokohama's Shiraokadai All-Girls' High School, enrolled in class 1-B, commuting from home to school each day via the local train route. Sometime prior to the first game, Yuna and several other girls entered the "Miss Ojousama Contest", an intergalactic beauty pageant, with Yuna herself being chosen as the winner. In doing so, she became an instant celebrity, and began a career as a popular idol singer. One night, the Matrix of Light Elner appeared to Yuna. She introduced herself as part of Yuna's personality (literally translated, "her other self"), and asked her to become the Savior of Light. Yuna then learned a great evil was about to invade the universe, and that Yuna herself had been charged with its protection. Thus began the first of Yuna's intergalactic adventures. Yuna is sometimes a bit clumsy and prone to making silly mistakes, and at first glance, one would think she's a natural airhead. However, she has a very energetic and positive personality that more than makes up for her shortcomings. She isn't very skilled as an idol singer, nor is she quite diligent in her studies and exercise routine, and both her enemies and friends often wonder whether she has any potential talent that has yet to be unlocked. During battle or times of great personal danger, Yuna undergoes a henshin sequence and appears wearing her armored battle suit, the Light Suit. 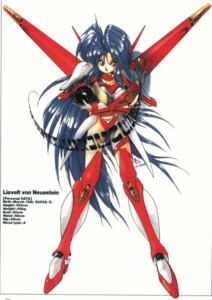 Her Light Suit has a very large array of weaponry to use in her battle against the forces of evil, ranging from a sword and rifle to an incredibly powerful beam cannon called the Matrix Divider (In "Galaxy Fraulein Yuna 2: Eternal Princess", it is upgraded to a more powerful version known as the Matrix Divider Plus). Yuna is also a HUGE fan of the TV superheroine Ojousama Kamen Polylina (or Polylina the Masked Maiden), proudly boasting her status as "the #1 fan of the "Polylina-sama Fanclub". This fandom borders on complete obsession, with Yuna even going as far as referring to Polylina as her "one and only". Her heroine is in fact a TV character played by her best friend Lia, but for some reason, Yuna NEVER manages to figure it out. In fact, Yuna's affection for Polylina is a major running joke in the series, with Lia often reacting in some (usually humorous) fashion to Yuna's fangirlish (and somewhat misguided) proclamations of shōjo-ai for her idol. Her friends call her by a variety of nicknames, including "Yuna", "Yuna-rin", and "Yuna-san". Yuna Kagurazaka currently lives with her parents, Naoko & Yuuichiro Kagurazaka, on Earth, in Japan's Yokohama Prefecture. 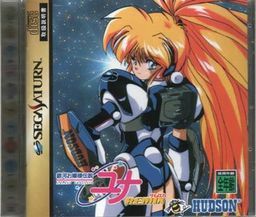 Misaki's debut appearance is at the PC-FX game Galaxy Fraulein Yuna FX: Selene of Sadness and Galaxy Fraulein Yuna OVA: Siren's Sadness. As an intelligence officer of the Galaxy Alliance under the codename: Selene (or Saline in ADV Films' translation) she disguises as a mysterious transfer student in Shiraokadai HS All-Girls' High School to investigate claimed charges that Yuna is trying to take over the galaxy. Later, thanks to Fraulein D's plot, she wrongfully accused Yuna for terrorizing the city and arrested her. Before Yuna's execution, she listened to positive testimonials of Yuna's friends, which caused her to realize that Yuna is truly innocent. In the nick of time, she prevented the execution, foiled Fraulein D's plan and entered into Yuna's circle of friends. 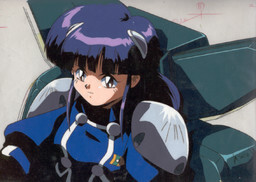 Unlike others who receive their armored suits from outside sources Misaki's armored suit is standard issue to the Galaxy Alliance. She specializes in long-range combat with her Linear Railgun, has access to secret files of the Galaxy Alliance for intelligence gathering and has the ability to teleport, one of the only characters other than Lia that can perform such a feat. Lia was the leader of The 13 Frauleins of Darkness, the 13 servants of the Queen of Darkness. She was defeated by Yuna in the first video game. Since her defeat, she has become one of Yuna's closest friends and a powerful ally. Her alter-ego is Lia the Phoenix. Lia is also Polylina the Masked Maiden, a mask wearing, crime-fighting superheroine with her own TV show. For some reason, Yuna never figures out that her friend Lia is also her beloved Polylina. Lia (and Polylina) has a robotic pet cat named Milky, who can transform into various weapons. Her real name is "Culture Computer No.3". 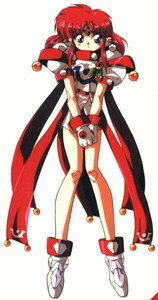 She first appears in Galaxy Fraulein Yuna 2: Eternal Princess as a captain of an extremely powerful battleship, the titular "Eternal Princess". Scattered throughout the galaxy, hidden beacons are placed throughout every planet left eons ago, which monitors the level of conflict in the area. Whenever there is a strong level of conflict, such as interplanetary warfare, the beacon signals the Eternal Princess to go and stop the wars from reaching galactic scale by destroying the planets that are involved with its main cannon. When Yuna and Erika engaged into a cat-fight, they happen to be close to the beacon which signals the Eternal Princess to come and destroy Earth. Luckily, with the help of Yuri, Yuna managed to stop Earth's destruction and gained Princess Mirage's friendship. Now Princess Mirage orbits around Earth watching over Yuna, and giving the often-oversleeping Yuna her daily "morning alarm" (which usually provokes a rather humorous reaction from the rudely-awakened Yuna). Princess Mirage is designed by Kōsuke Fujishima, hence the strong resemblance to Belldandy from Oh! My Goddess. Yuri is an android created by a highly advanced race. 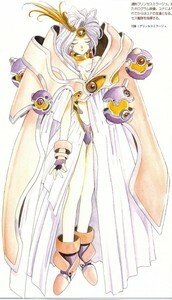 She was discovered in some ancient ruins on the moon during the storyline of "Galaxy Fraulein Yuna 2: Eternal Princess". Yuri came home with Yuna and lives at her house, and then becomes Yuna's best friend. At some point, she becomes the Kagurazaka family's adopted daughter, making her full name Yuri Cube Kagurazaka. Yuri is best known for her insatiable appetite, which has led some fans to speculate that she may have a black hole for a stomach. Yuri is immensely strong though performing feats of strength depletes her energy reserves, at which point she must eat to regain her strength. Quite humorously, her appetite is also her biggest weakness, as Yuna has been seen bribing Yuri with food on more than one occasion. In combat, Yuri not only uses her super strength, but she uses a weapon called Twin Dragon Fangs that can interchange to Sword mode or Gun mode. Also, she can create reinforced parts for upgrading El-Line to the more powerful El-Line Noi. "Incite another murder?! You're makin' me sound like the bad guy!"